Fishermen and women from all across campus competed in the first Bemidji State University annual ice fishing tournament hosted by the Outdoor Program Center Saturday Jan. With the weather on their side, 65 fisherman competed for a variety of prizes totaling to over $1,000. 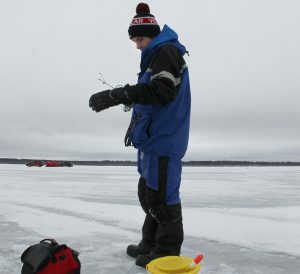 The tournament was supported by contributions from Pepsi Nei Bottling of Bemidji, Port-Able John Rental and Service, Inc., of Bemidji, St. Croix Rods, Security Bank and Northland Fishing Tackle. The fish were all judged by length rather than by their weight then released immediately back into the water. The first place winner for the largest Northern Pike went to Emily Kurst with 22 and ½ inches. The first place winner for the largest Walleye goes to Hunter Churness with 16 inches. The first place winner for the largest Perch goes to Sean Anderson with 10 and ¾ inches. 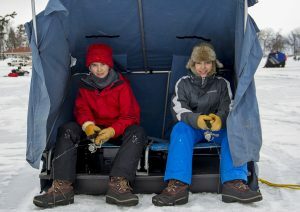 Among the festivities that added to the winter fun were a few miscellaneous prize drawings: cash prizes for the oldest and youngest fisherman, the 7th and 15th fish caught and measured and the winner for the smallest fish of the day which went to Dane Lynch with a 3 and 7/8 inch Perch. Brothers Casey Hiller and Zane Hiller brave the cold in hopes of winning the Beaver Freeze Ice Fishing Tournament. Photo by Shawn Campbell. 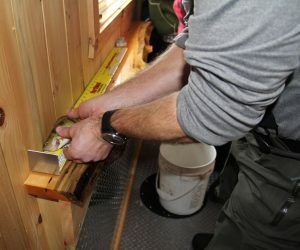 Mark Morrissey, director of the Outdoor Program Center, measures this perch before he releasing him back into the freezing waters of Lake Bemidji. Photo by Shawn Campbell. 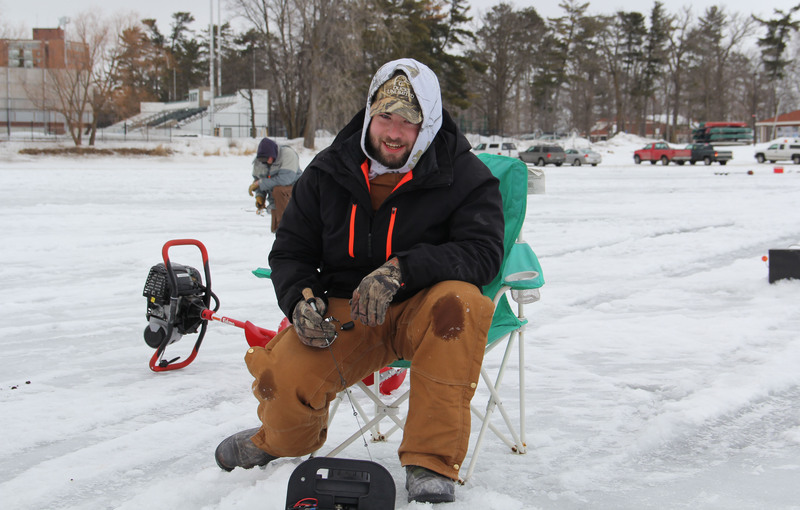 Brandon Koehnle from Rush City, Minnesota heard about the Beaver Freeze Ice Fishing Tournament from his roommate. He hopes to hold bragging rights over his buddy by catching the biggest fish. Photo by Shawn Campbell. Brent Dorn watches Kayla Morey and Baylee Johnson measure and record the length of his Walleye he caught. Photo by Shawn Campbell. Not having luck at his previous hole, Matt Laughling moves to a new one where he readjusts his line to get to the right depth. Photo by Shawn Campbell. 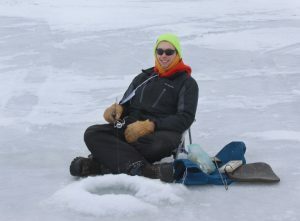 Brian Mason happily sits on his homemade ice fishing chair. He likes being closer to ice so he can be closer to the fish. Photo by Andy Kucera.